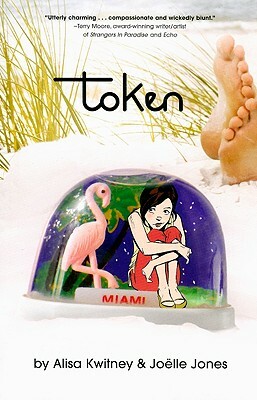 It's 1987 and 15-year-old Shira Spektor lives with her father in a funky apartment building on Miami's South Beach. Shira has been totally devoted to her father since her mother died 12 years ago. But when her dad falls in love, Shira suddenly feels left out. Young adult. Shira lives in a Miami hotel with her widowed father and her grandmother. When Shira’s father begins todate his secretary and their relationship turns serious, Shira has trouble accepting how he is changing. And,for his part, her father can’t communicate as well with an almost 16-year-old Shira as he could when shewas just a little girl. Shira turns to petty shoplifting and the arms of a mysterious Spanish boy to cope withher feelings. All the ingredients of a standard—and credible—YA problem novel are here, but Kwitney’s script and Jones’ expressive black-and-white art make the story fresh and worth the quick reading time. Relationships are authentic, and both adults and teens evidence a true depth of character. The sadly soonto-be discontinued Minx line again upholds its standard of well-crafted and original work, and readers ofToken will want to look to Re-Gifters (2007) and Good as Lily (2007) for similarly well-told tales about the emotional hardships of growing up through accepting others as well as oneself.